Wouldn't you want to know what he's listening to..
Henry was spotted in his RMCTF hoodie, as he took a stroll with Kal (looking his fluffy gorgeous-self) in London last week. 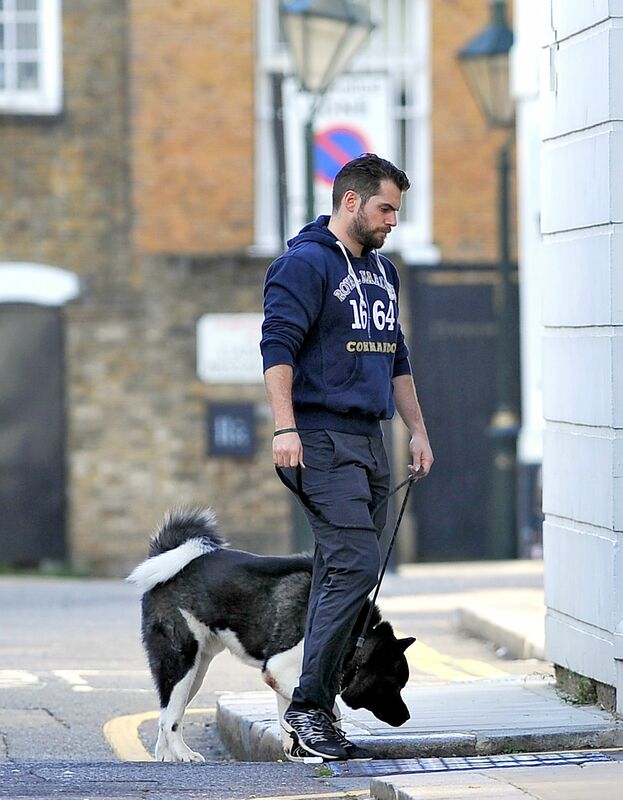 It's nice to see Henry and his furry baby enjoying some quality time, before he leaves to film Sand Castle in Jordan. 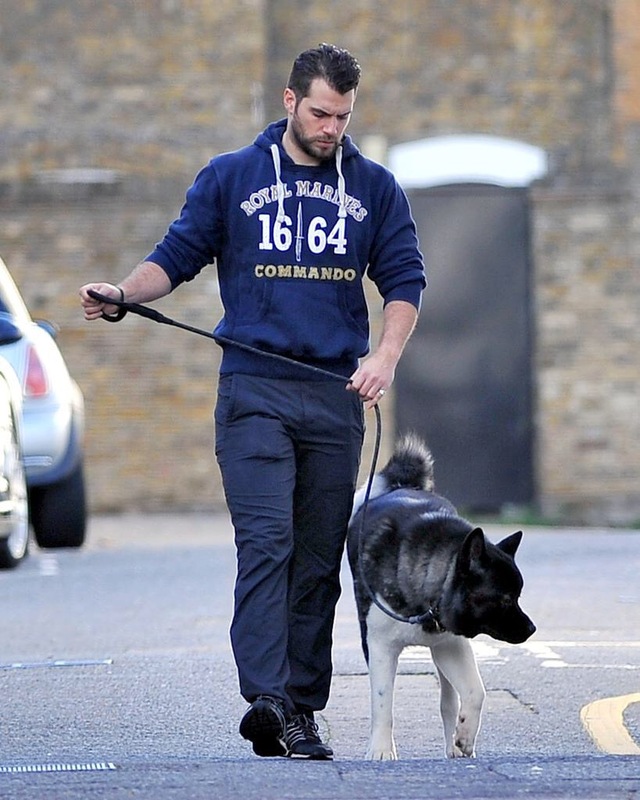 "Henry Cavill attempted to take his dog for a low-key walk in London, while sporting a commando sweatshirt -- not that low-key is possible for him ... with that face, and the whole Superman thing." "Oh hey Henry Cavill, look at you wearing another hoodie as you walk your dog around London. 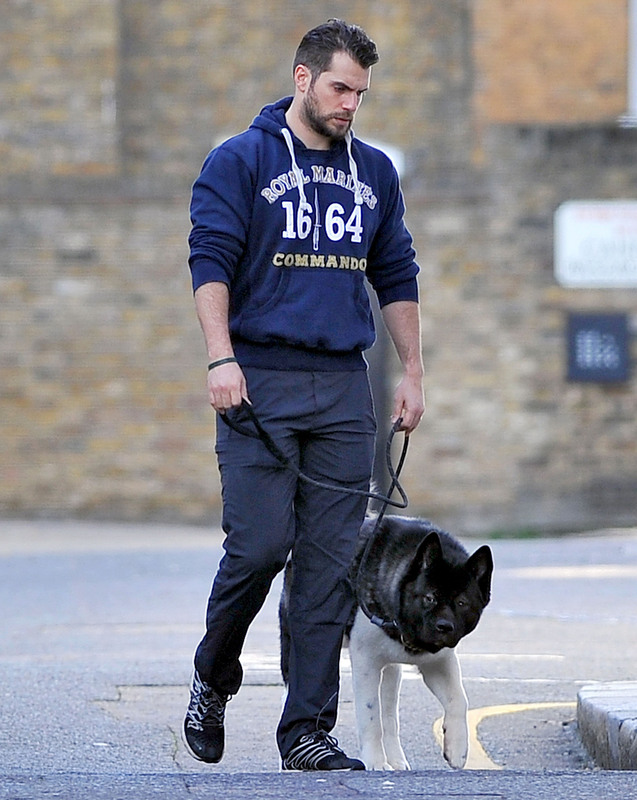 The Batman V Superman: No Really, Please Let This Be Good star kept it quite casual as he and his dog strolled around the city (so much strolling today). The photos are apparently from last week, but if you think I was about to deprive you of the Cavill hotness, then it’s like you don’t know me at all. 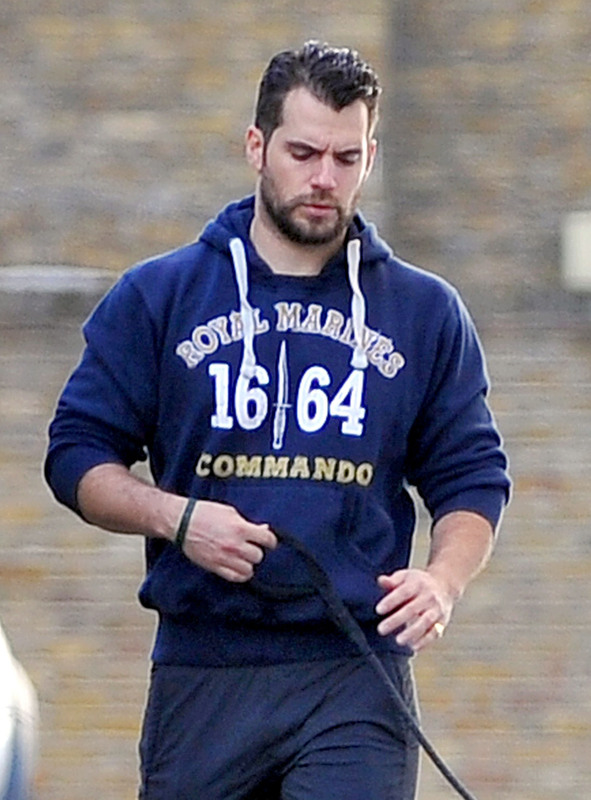 And it case you guys can’t tell, Henry really loves the Royal Marines Commandos." 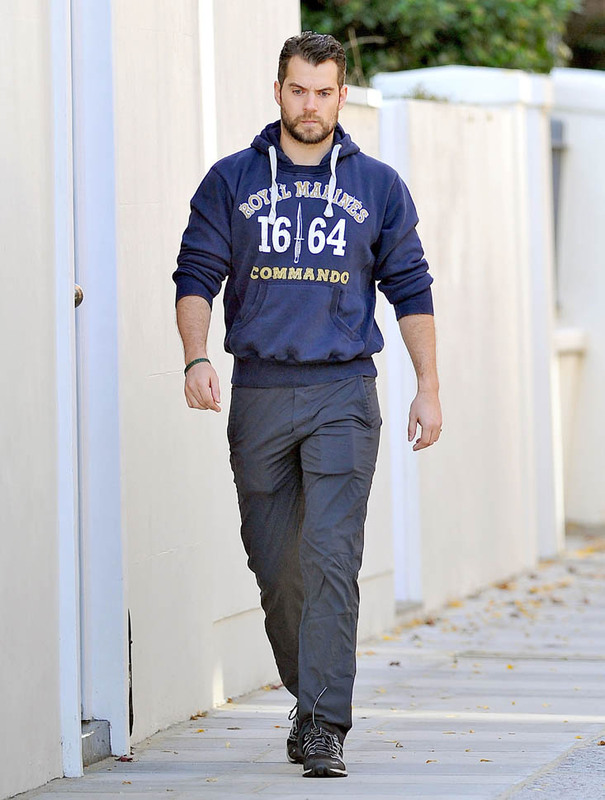 @HenryCavillNews rocking his @RMShop1664 hoodie! One pic it looks like Henry has a lot on his mind. Wish him well on his movie project. Can't wait to see it. Thanks for keeping us all updated on Henry. He is truly a one of a kind gem of a man, not just in looks but in everything he does. p.s. Sometimes I feel he just needs a good hug, a real genuine hug. I totally agree. If you throw yourself at a man, what does that say about you as a woman? I was raised better than that. I think Henry wants a real relationship. Feel like he's seen to many fail in his line of work. Yes he is very handsome but there is more to him than that or anyone for that matter. We base too much on looks and not enough on what really matters. My heart goes out to him and I hope one day to see the smile reflected in his eyes instead of the sadness that seems to be there. I understand that emotion. That's such a double standard. There are tons of pics of him with male fans as well, who tag fansites too. Why would the girls be throwing themselves at him? Just because they want to have a picture? Because they are happy to share them? The way women put each other down is unbelievable. Plus, the way you read things. 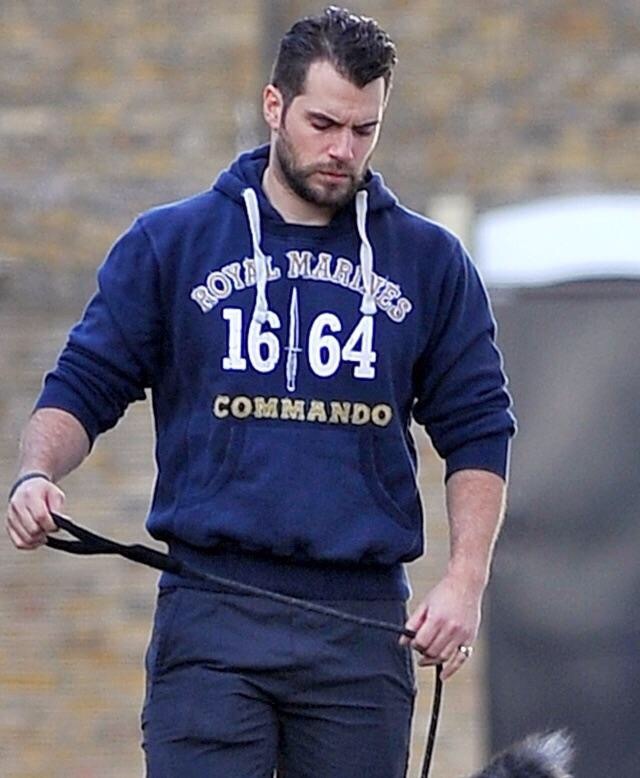 The man is walking his dog... he just looks serious. He could be thinking about a new project, listening to a song. Why would he be sad? Men put each other down too! About him being sad. He looks it sometimes. His fans obviously care enough to notice. 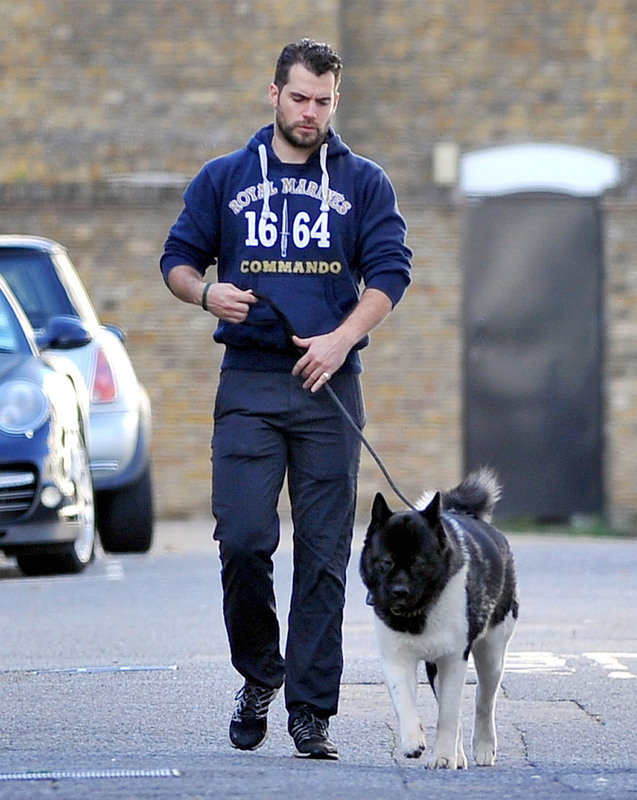 It might be because he's leaving his dog to go film his movie. I know when I leave my cat it makes me sad. She's my family as I'm sure Kal-El is his. And then again maybe he is deep in thought. Thinking about his movie. Everyone views things different. If we viewed everything the same we would be boring as hell. Human nature, how wonderful and insane all at the same time. Crazy world we live in where society dictates every word you say, write, or even think. Where you have no privacy and are scrutinized for everything. We need to be nicer to one another. which street is he walking on? Is that really anybody's business? HUGS? did someone say HUGS? I'm in! Big bear hugs are the best!! 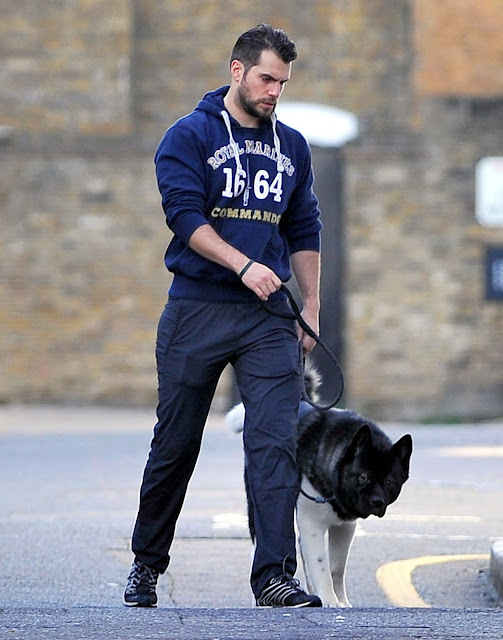 and yes I agree a genuine hug is needed or both Henry and Kal :) so where does the line start? He is very professional in everything he does so I'm sure he is already preparing both, physically and mentally before he heads out to Jordan. I wish him all the best filming Sand Castle! 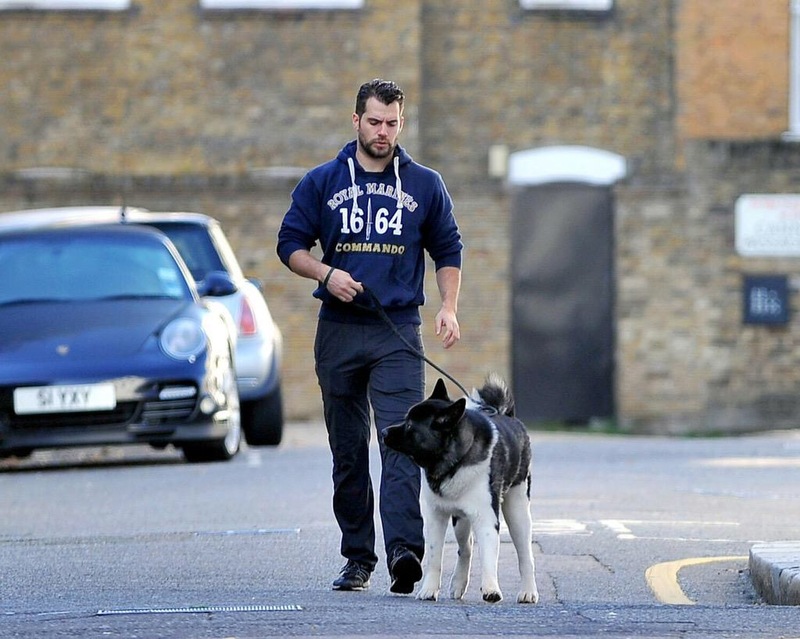 I love when we get to see new pictures of him though :) Thanks HCN! We're so happy for him! - Hopefully we get set pics from Jordan. How close is Henry to getting the Virginian? Huge film. It'd move him to the A list for sure. He can't film JL2 and The Virginian. One has to give way. Henry's apparent interest in the George Washington pic says it all. Only downside I see is that that the Virginian is not a franchise film. But then again maybe that is for the best. So wish he'd gotten Ritchie's King Arthur. Which is meant to be a franchise. Fingers crossed, major announcements are coming in the coming months! We're excited no matter what comes his way! I think he is sad to leave his new young girlfriend. This is my opinion and feeling toward this so don't be mean to me for it. 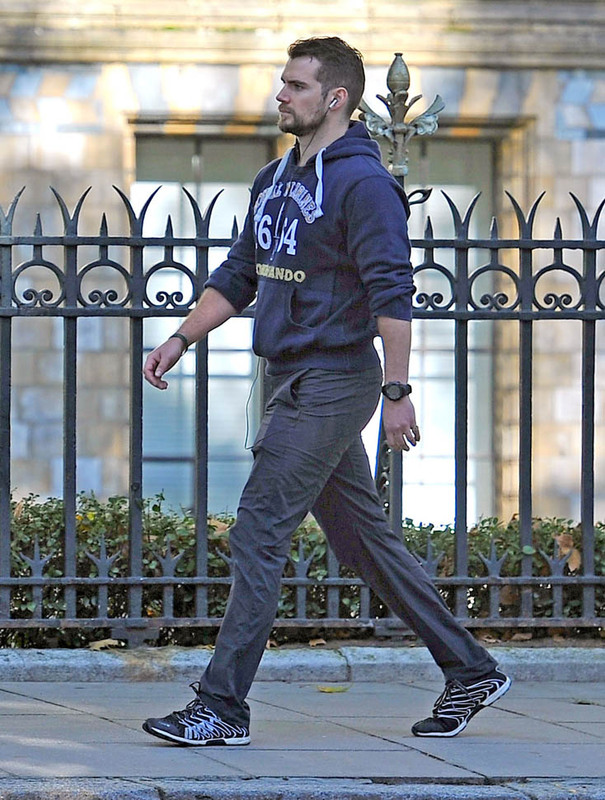 He might be looking sad because he's out walking his dog and some stranger starts to take his picture. It's not like he's at work or at an event. At least he's smart enough to know stuff like that is going to happen, so chooses to represent a charity when it does. It's a lovely thing to do. Um...wow! What is it about that man. He gets more gorgeous. Is that even possible?? If he is sad, he must know that his fans are there. I'm ready to cross the Channel to join him and make him laugh. I am willing to leave everything behind to live with him. Maybe he is sasd to be leaving his new girlfriend, can't be easy leaving people when u go away. A gf he hasn't been seen with since the game. It is part of his job. If it is for real, she will wait for him. Where on Facebook and Twitter? I recently read an article that Henry was looking for someone who was around his age and has a career. His last girlfriend and this new one are both young college students. I guess the article was false. Wouldn't like to live his life sometimes cant do right for doing wrong, hope he's OK though. That's what I said. That he looks sad but somebody didn't like that. At least I'm not the only one that sees it. And also I've read the comments about him and his so-called girlfriend that's 19. That really doesn't seem like something Henry would be serious about but I could be wrong. I just wish him happiness. He seems like a smart level headed man. Choose wisely Henry! It's true about the 19 year old girlfriend, he does like his girlfriends young doesn't he, some people go for younger partners some go for older partners, each to their own I suppose, just hope he has a good network around him. Wow! 19? Really? That's barely an adult in the UK. Knowing how's old his girlfriend is I do look at him differently. he has a new one? I see him differently too. She's a teenager who is still in higher education. Being in the public eye his PR/management team need to do their research before he goes on a date. Surely it's not that difficult with social media. You would had thought that his PR/management team would protect him more especially after the debacle over the last girlfriend. This place is becoming as bad as IMdb. NOBODY has facts. People calling rumors facts. Let Henry live his life. 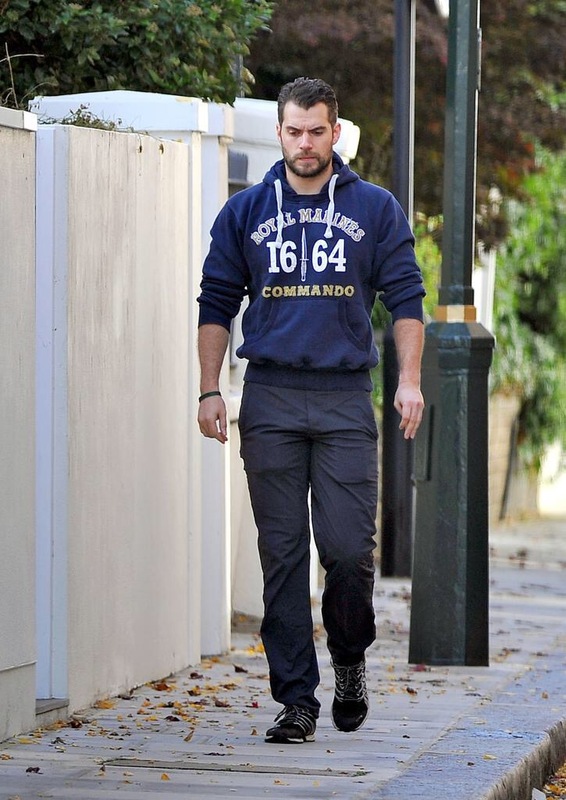 Maybe he isn't happy about the paps being so close to his house and he's pissed about that. I wouldn't blame him. Maybe someone who is a blog administrator should clarify the new girlfriend information. Shouldn't they know something? Thank you for your feedback. We try our best to moderate comments based on the guidelines listed below. There is nothing to hide, please remember we are a fan site that is in no way affiliated with Henry or his reps as listed in the disclaimer on the sidebar. Have a good rest of your weekend. He is an adult, 32 years old. He must be able to make a sound judgements about his dates, his relationship and life choices.,because he is old enough to know who is for him and who is not right for him. If he has met his ideal partner he will be full of love, light and laughter, he would radiate peace and everyone would know it. Whatever choices he makes let's wish him the best and leave it at that. We don't have long to wait to see if his rumored girlfriend is the one for him and if she is not then he will move on like we all do and keep going till he finds somebody suitable for him. Well if he is into short term romances that end up nowhere he be picking up girls left right and center and do like every other men does, but if he is looking for somebody exceptional that is worth his time I doubt he be doing that. 32 years old is a great age to start thinking about meeting a woman he can potentially marry in a couple of years and have children with . Of course we be just watching TV and get to hear about his newest girlfriend or break ups etc .., hooking up with people just for the fun it hardly ever ends up fun on the end. He seems mature enough not to be like every other men, being a man who is looking for somebody exceptional rather than just getting into a relationship because he is alone . we will never know if he is what he is seems to be. True, looks fade as we age, it takes more then looks that's for sure! It seems people get caught up in the looks that forget it takes Far more then a pretty face to make a person great. Exactly--no one on this website really knows him! But many write as though they do, assuming good and bad things about him. But the assumption that he can do no wrong is delusional. Really--it's an important life skill to learn to put NO ONE on a pedestal. We're all human and flawed, and we'll all fall off in short order. I find it absolutely bizzare that people look at anyone through such rose-coloured glasses. I agree. I just believe Henry is more level headed and smart than what we are hearing and seeing, I could be wrong but hope not. He truly seems like an awesome man to know. In choosing a lifetime partner you want someone you know who loves you for who you are and will be there to support you no matter what. Most men and women let the best thing slip on by because it wasn't pretty or good enough in their book, then regret sets in and they realize later it's gone. As you said looks fade. Loyalty, honesty, and morals, a sense of self....that's what is needed. True? They spelled COZYING wrong. Great spell check for a mag. In England cosy is spelt with an s not a z. Sorry, they have spelt it correctly for the UK. Well best of luck to him and her. Time will tell how long that will last, in either case she is ONLY 19 years old, its hard to imagine besides the looks what else she has to offer him, but if he is mentally at 19 years old they be perfect for each other for a while. I would love to know why my comment was erased. I wasn't rude or insulted anyone. Just stated this could be similar to the story with his previous gf. plus it goes against everything he said in recent interviews. Don't feel bad. I've had some deleted too! And they were supporting comments. I think the blog administrator doesn't like nice. We should start our on blog. Henry supporters no matter what. WE CARE! Again, please read the simple guidelines listed below. This blog is here in support of Henry as we have always been. You are more than welcomed to comment, but personal attacks -- on anyone -- won't be tolerated. I'm sure there are plenty of other places where you can do that, this blog is not it. Thank you for your understanding. That doesn't necessarily mean they are dating, because there's an article saying they are, it could be fake (not saying that it is, but its an article and sometimes they lie and use rumors in them). However if it is true, then I will be waiting (and hoping) to see a break up article in the next few months. This is not meant to be rude or to offend anyone. The negative comments on here and on the Daily Mail website make me feel sad. I loved UNCLE and want to be supportive of Henry's career. Why are celebrities private lives so public? Because they chose this line of career unfortunately. Its hard to be famous and have a private life, but some people make a great effort and are able to live very private lives, its possible if the person wants that. Hey blog administrator - I would delete all of the comments! I don't know how you deal with this. Really? What was so wrong about the last comments made? Sounded and was read like the person truly felt for Henry. There are worse comments I've read still on here. Wow! I guess supporting him and caring is wrong. I guess raking him over the coals is just grand. Bet this gets deleted. If so, maybe some will start their own blog. Not easy to be famous, that's for sure. Let him live his life, hopefully he is happy that's all it matters. I would want to be wished happiness not easy this life, we need to be kind to one another. Not easy to be in the public eye at all. Because celebrities represent brands and charities etc it all gets so complicated. Respect is something earned not something given. fans care deeply about him and want the best for him. He has options because he has wealth and he can go and meet mature and educated woken, women who are comfortable in their skin and have lived life can be his support system, but he picks up a gilr from a night club, that's shocking to me. With all the resources and things he has available, all the money he has he can meet the best educated women or at least women at his age group, but no we always go for the heart break. He is not stupid he knew this will blow up in his face, he knows his previous interviews stated him saying he is looking for somebody his own age and for a partner, but then he goes and picks a girl from a night club.? Let mW say it simply, NIGHT clubs are not places in general to meet a good partner period. Look at Ammal Colony , this woman has edue and class, that type of women you seldom will ever find them in clubs, period. So dear Henry, find a woman your age group, be selective, choose somebody down to Earth, don't date 19 years olds, they hardly be your match. I think some sessions with a counsellor would do this guy a world of good. Why is he saying he wants a stable life partner, then meeting 19 year olds while drunk at clubs? What is that about? Maybe he does have a pathological lack of self-confidence, or maybe he is naive and too trusting? Whatever the case, there should be no stigma attached to seeing a counsellor. Life is tough for everyone, whether we have money and fame or not, and taking steps to work towards a healthier mental/emotional state is a sign of courage and strength, not one of weakness. He perhaps needs to rethink his choices And if I am his mother I will slap him silly. I am surprised he chosen 19 years old girl to take out to a rugby game, considering HE is that good looking and have that much power and wealth and can have any single woman out there and for him to pick a 19 years old shows he is either insecure, immature or he has zero skills when it comes to meeting women his age and and easiest for him to pick up are younger girls he can manipulate, but if he is to get a strong woman he wouldn't know how to behave because he has been dating only little girls. Mature women would want respect and expect him to act for sure like a man not just in his movies but in real life. Would you people stop ASSUMING??? It is so embarrassing reading all of your comments, seriously! He needs therapy? He made a mistake? He dates the wrong women? The girl is 19 - SHE IS OF LEGAL AGE. Get a grip. Many people have a huge age gap with their partner. You don't know anything about the girl, and you don't know anything about Henry aside from what he WANTS US TO KNOW. I come to this site bc I am a fan of Henry, and I love all the updates, but you jealous, overly dramatic people are taking the fun out of it. Do me a favour! Screencap all of your comments and read them again when you have grown up - you will be embarrassed too! 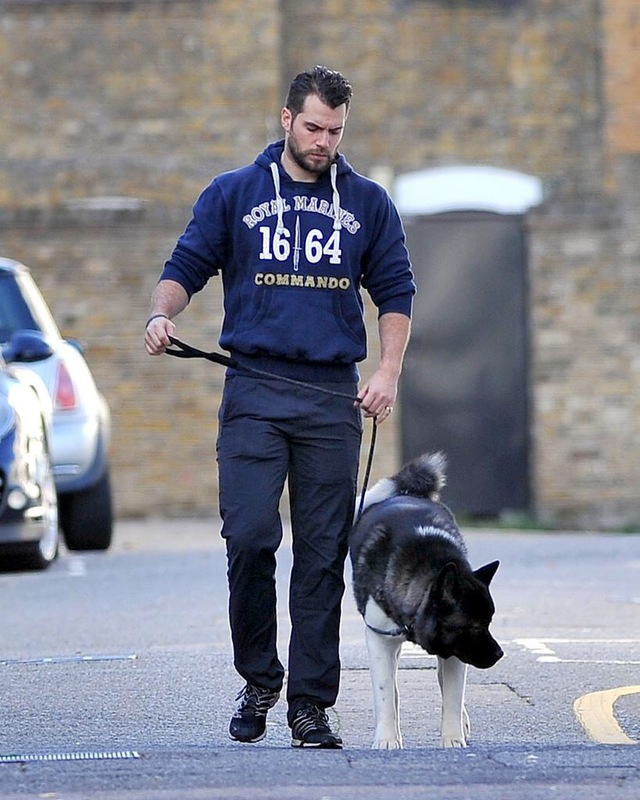 The man is old enough to live his life without a bunch of online mommies who claim to have only his best in mind - when we all know that you will find a flaw with EVERY woman Henry is pictured with. WAKE UP CALL - it'll never be any of us, so please stop the drama. I am going to avoid this site - sorry admins, you are doing a great job, but one just can't ignore the crazy theories some people spread here. Hey relax we can comment all day long, HE is chosen to be a public figure, so rather than fight his battle for him like you know him, let us give an opinion after all he is chosen this line of work he can take the heat can't he? Don't fight a battle over him, hr is a grown up man why don't you accept that as a public figure he has an image to uphold and a career that's on the line, of course people will comment. What do you expect? He is paid millions and he again public figure, so stop the lec ire and allow us to say what we like. Nobody is telling you what to do so don't tell me how to think. And yes we know we are not going to date him Hello why do you bring that up? Strange? You date him and deal with everything that cones with him and tell us in a year that who it is all going for you. *facepalm* Read again. Then reply. Also people make him what he is, he is famous because people like us middle class folks buy tickets to his movies and watch him on TV . he knows exactly what comes with his line of career choice! If you think we are wrong like you said avoid to come and comment !